In the Mexican state of Sialoa, a new law passed severely restricts the media – essentially banning all original reporting of criminal activity by limiting sources of information to news releases, as well as banning all video, audio, and still photography of persons involved in a criminal endeavor. The move makes Mexico teeter on the edge of becoming an all out totalitarian regime with absolute control of the media. The new law prohibits all interviews with public officials, limiting potential information to news releases. Under no circumstance are news outlets allowed to enter places of activity, to take audio, video or photography of the persons involved in the criminal event nor handle information tied to public safety or the enforcing of justice,” the law states. The law also limits all interviews of the victims or the suspects, restricting media to interviews with their attorneys. You know the old saying about sacrificing liberty for a little temporary safety – you get neither and deserve neither, well it seems Mexico’s newest experiment in government dominance of expression and media will test that truism. Mexican officials contend the state was not trying to commit abuses or shorten the freedom of the press but to allow for creation of conditions that guarantee the free and safe exercise of the profession. Naturally, as soon as the word of the new law got out, journalists stood up for the constitutional freedoms guaranteed in their constitution and denounced the new law. Unfortunately, this is just another act of the new authoritarian government led by current Mexican President Enrique Peña Nieto who seems to be trying to bring back absolutist control over much of the country and fleece the people of their constitutional freedoms. This is an obvious example of intolerable censorship. The sense is that if they control the media, they can control the image that has been developing in the media of Mexico as it loses the drug war, becomes besieged by drug gangs, and the streets have become awash with countless murders of often innocent people. Any time government controls media, it distorts the message, if not obfuscates it entirely. 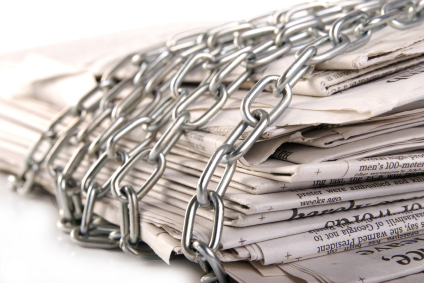 While it is important to make sure that the information that is published is accurate – the government can’t be trusted to wield the power of the media. It was particularly shameful that the legislators in Sinaloa failed to question the law and simply raised their hands. My hope is that this doesn’t set a dangerous precedent for other states in Mexico to approve similar legislation. It is deplorable, and very damaging to the freedom of expression in one of the most dangerous places to be a journalist.